25 –Raymond Barrow Walking Blues. 31 –Slim Barton And James Moore Poor Convict Blues. 46 –Big Bill And Thomps Big Bill Blues. 80 –Blind Blake - Charlie Spand Hastings St.
81 –Blind Arthur Guitar Chimes. 117 –Henry Brown And Ike Rodgers Blind Boy Blues. 182 –Teddy Darby Lawdy Lawdy Worried Blues. 190 –Blind Willie Davis Trust In God And Do The Right. 197 –Delta Big Four Moaner Let’s Go Down In The Valley. 198 –Delta Big Four Jesus Got His Arms Around Me. 267 –Clifford Gibson Tired Of Being Mistreated Part I. 307 –Harum Scarums Where Did You Stay Last Night? 323 –Katherine Henderson (3) Have You Ever Felt That Way? 520 –Norfolk Jazz Quartette Oh What Is The Matter Now. 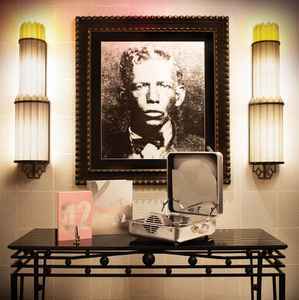 530 –Charley Patton Pony Blues. 565 –Charley Patton Joe Kirby. 613 –Bob Robinson (2) And Meade "Lux" Lewis Sittin’ On Top Of The World. The vinyl albums do not have paper labels but have the side number etched into the record where the labels would be. * 800 newly-remastered digital tracks, representing 175 artists. * 6 x 180g LPs pressed on label-less alabaster-white vinyl, each side with its own hand-etched numeral and holographic image. * Polished aluminum and stainless steel "Machine Age" cabinet, upholstered in sapphire blue velvet. Discogs search engine keeps bringing me here again and again. Whatever keywords you're searching for there is like a 10% chance they are contained in this release. I ordered my copy back in March 2016, it's numbered 4363/5000, so I would say don't leave it too long if you have your heart set on buying a copy and you want to grab a brand new copy from the third man store before it sells out. If you are feeling particularly flush you could plump for the Vol. 1 and 2 bundle and almost 20% off the total. They are still available as of today. An excellent conclusion to this two part set. I think that the artists represented in this volume are much stronger in recognition and appeal. you can't go wrong with either volume. If you have the bucks, spring for both. It's a well spent investment.